A man was shot and killed by San Diego police Wednesday in a trailer park in San Ysidro Wednesday afternoon. Officers were called to the park off Willow Road near Calle Primavera at around 1:30 p.m. after witnesses reported seeing a man with a rifle running through the complex. SDPD Acting Captain Anthony Dupree said witnesses reported the man fired two shots inside the complex before police arrived. Another witness reported the man pointed his rifle at them. Officers arrived at the scene about five minutes after receiving the call. As they tried to make contact with the man, he pointed his rifle at officers and an officer fired several rounds at the man, Dupree said. A man with a rifle was killed in an officer-involved shooting in San Ysidro, according to the San Diego Police Department. NBC 7's Joe Little has more. The suspect fell to the ground and officers immediately began administering CPR until medics arrived and took over. The suspect, identified only as a man in his 50s, was pronounced dead at the scene shortly after. No officers were injured. Dupree said witnesses described the suspect's rifle as an AK-47, but said investigators have yet to confirm the weapon model or if it was equipped with a high-capacity magazine. The rifle was loaded when officers recovered it, SDPD said. 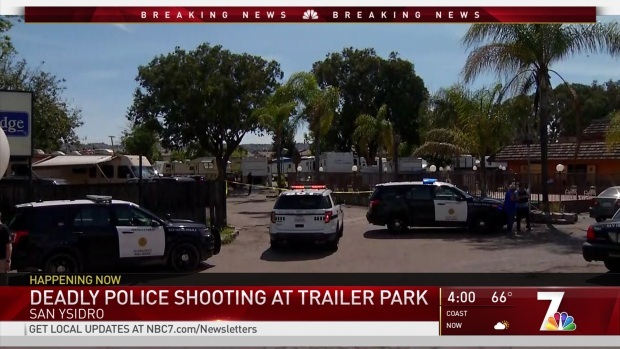 It was at first unclear if the suspect was a resident of the park or if he had any family who lived there, but SDPD later said investigators believe he was in fact a resident there. Dozens of SDPD vehicles were seen lining an area surrounding the park and the entrance of a Travelodge hotel next door. Dupree said residents of the park were being kept out of the property as officers investigated. Travelodge guests were being escorted in and out of the hotel. The officer who fired the shots at the suspect will be placed on administrative duty while the shooting is being investigated, per SDPD protocol, Dupree said. His name was not released, but SDPD said he is a 2-and-a-half-year veteran of the department.
.@SanDiegoPD is working a critical incident in Southern Division. ABLE, multiple officers are in the area. Details to follow. Police cordoned a section of the park, and appeared to be focusing their attention on one trailer. They also roped off a parking lot near a swimming pool. Investigators could also be seen interviewing witnesses, gathering information about what led to the shooting. 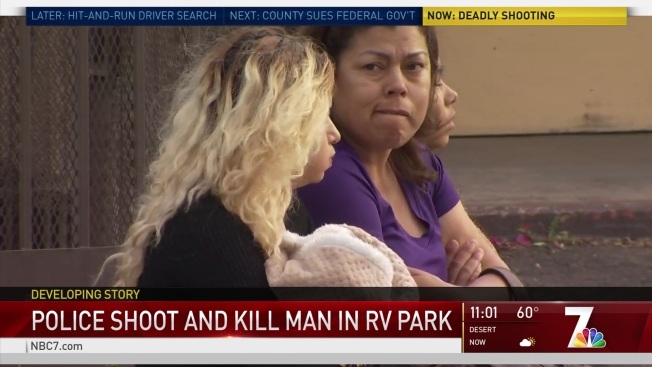 NBC 7 spoke with several park residents shaken by the incident. Vanessa White says the suspect was her neighbor and lived with his wife and family. "I'm just kind of scared. I don't feel safe," she said. "He didn't look right in the head.. He was hiding behind cars and acting sketchy." Resident Enrique Sandoval said his wife was walking their dog with his 5-year-old daughter when they heard two to three gunshots. They ran back to their home and were not harmed. A rifle recovered by police at the scene of an officer-involved shooting in San Ysidro Wednesday afternoon. SDPD has not confirmed the model of the weapon. “It’s not safe. It’s not safe, especially in front of a school, it’s not safe,” Sandoval told NBC 7. At 2:02 p.m., SDPD announced that a lockdown at a nearby school would be lifted. At 2:10 p.m., police said the situation was secured and the residence was cleared. There are no outstanding suspects, according to officers. SDPD and San Diego Fire-Rescue responded.